STATE CAPITOL, PHOENIX – Speaker of the Arizona House of Representatives Andy Tobin, R-Prescott (District 1), and House Minority Leader Chad Campbell, D-Phoenix (District 24), recently sent a letter to Gov. Jan Brewer urging her to prioritize the state’s infrastructure needs by restoring the Highway User Revenue Fund. 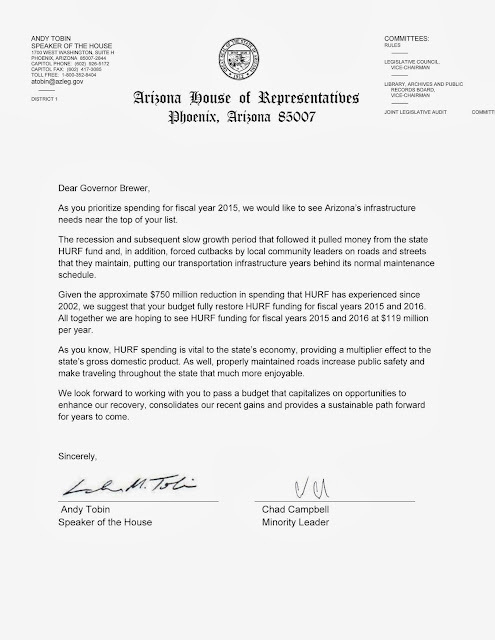 In the letter, the House leaders specifically requested that the governor allocate a total of $238 million to HURF in fiscal years 2015 and 2016. Since 2002, the state has diverted approximately $750 million from HURF, forcing local communities to scale down transportation infrastructure maintenance and development. Excellent roadmap to sanity and better highways in Arizona.. Commendable and realistic but what will the Governor do?